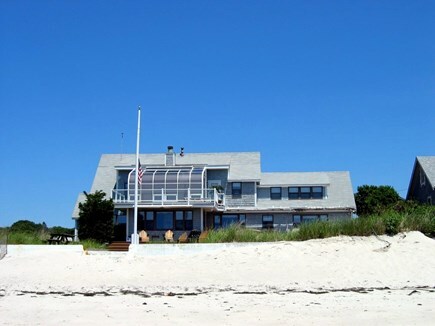 Cape Cod Oceanfront Home With Private Beach! Relax and enjoy this beautiful home on the ocean! The Ocean is Truly in our Backyard! Backyard View of Expansive Outdoor Living Area and Jacuzzi! Kitchen and Keeping Room with Ocean Views...Enjoy your coffee! Additional Living Room Great For Games, Reading, or a Nap! Bunk Room with 5 Twins and a Secret Playroom! Beach: On its own private ocean beach!!! NEW to WeNeedAVacation.com!!! We have been sharing our home via another vacation home website for years, but have made the switch to weneedavation.com! We we had to leave all of our 100% 5 star reviews behind when we switched, we will be asking all of our guests to write new reviews on this site for your benefit. In the meantime, feel free to reach out to us. We would be happy to answer any questions! 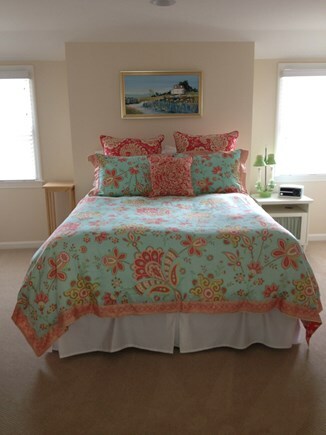 OUR HOME: Simply the ultimate Cape Cod experience! This gorgeously appointed and fully renovated six-bedroom, five full bath, oceanfront home is set on our private beach on Nantucket Sound. The setting beckons you to come, relax and play! Here you will find a fantastic spot for your family retreat. Once you turn off the car, you need not go anywhere else to entertain your entire family with the best Cape Cod has to offer. The waterfront location, private beach in your back yard, ocean views from nearly every room in the house, outdoor jetted hot tub, and gracious indoor/outdoor living make this the perfect spot for your family's retreat. Beach/Ocean: Ah yes, The Beach! It is literally part of your back yard and yours alone during your stay. 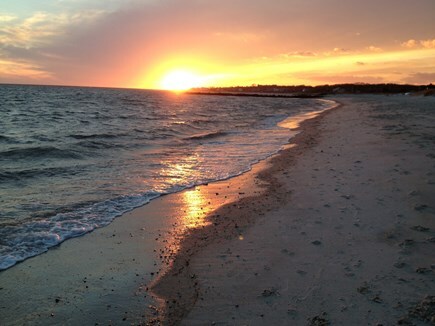 Beautiful sand, world-famous breezes, and warm gulf stream ocean water...THE WARMEST WATER ANYWHERE ON THE CAPE!... make it excellent for swimming, boating, and windsurfing. Incredible fishing, shell hunting, sunbathing, and barefoot exploring are all at your back door! Deck: Massive deck with plenty of Smith & Hawken teak furniture...outdoor dining table and chairs, adirondack chairs, steamer chairs, and a hammock for relaxing with a book or an luxurious ocean-air nap! End every day with an indulgent soak in the jetted hot tub overlooking the ocean sunset. Oh, and don't forget the private outdoor shower...a MUST for Cape Cod! Lawn: Spacious lush lawn perfect for croquet, catch or a family game of tag! Junior Suite: Ground floor queen sleigh bed with private full bath and seated walk-in shower with handheld option. 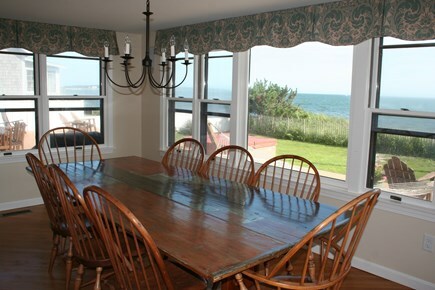 Large picture windows with expansive views of the deck, lawn, and ocean. Perfect for grandparents! Flat screen HDTV and DVD. 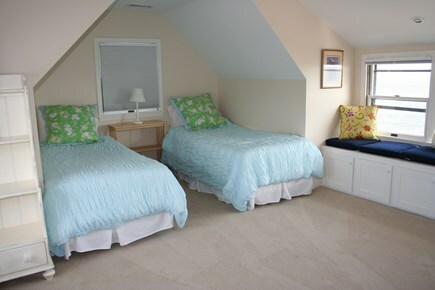 Sunset Bedroom: Ground floor queen bedroom with lawn and ocean views! Down the hall from a full tub/shower bathroom. 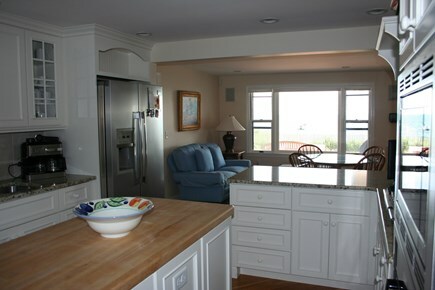 Kitchen: Watch the sailboats on the horizon while making sandwiches for the crew! Beautiful airy kitchen with granite counters, butcher block island, stainless steal appliances including wall oven, convection oven/microwave, 5 burner gas range, dishwasher, and fridge with water/ice dispenser. The kitchen is fully stocked with cooking, baking, and serving dishes as well as an assortment of spices. Both Keurig single serve and standard coffee pots on hand for all your hot drink needs! Small flat screen HDTV to keep you up to date while on vacation. Dining Room: Make more memories around the extra-large custom farmhouse trestle table surrounded by windows open to the relaxing ocean vies and refreshing salt air. Plenty of seating for everyone. Living Room: Read, relax, play games or be entertained by the built-in surround-sound system with brand new large flat screen TV, DVD, and DVR/cable package in this welcoming and cozy room off the kitchen. Gaming HDMI cable provided for easy connection. Custom designed couch and chairs provide a variety of comfortable seating options. 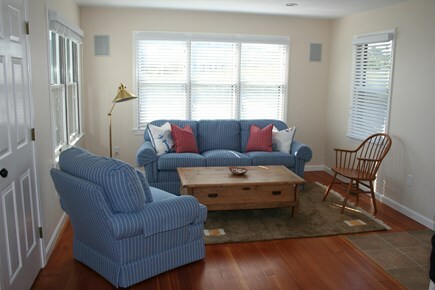 Bonus Room: Bright, sunny, and quiet second living room with custom designed sofa and club chair. The room can be closed off from the main living room with glass french doors. Lots of windows and lawn/ocean views! Small desk with printer/fax and modem. Full Laundry Room: Extra large washer and dryer as well as a laundry sink, overflow refrigerator, and beach toy/beach chair closet. We have all your needs covered! Spacious Master Suite: Floor to ceiling views of the ocean. Slide open the door to the private balcony for amazing views, ocean breezes, and the sound of lapping water on the sand. Flat screen HDTV, DVD player, and private sound system for your entertainment needs. Custom designed upscale marble bathroom with soaking tub and spacious seated shower with handheld option. King mattress with luxury linens. 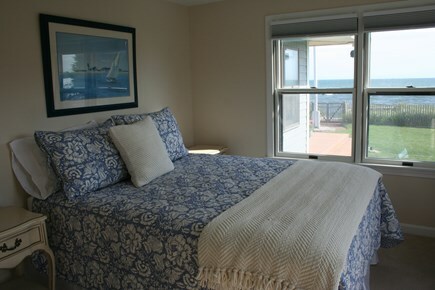 Hannah's Room: Two XL twin beds and a large window seat for reading or gazing at boats on the horizon. More amazing views! Custom private full bath with shower. This room is great for kids of parents staying in the Master Suite or for older kids or single adults that need that XL twin length. 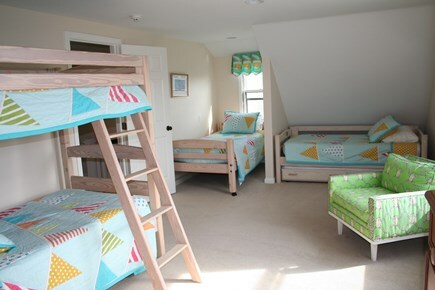 Bunk Room: One set of bunk beds and two additional twin beds all with headboards and foot boards. One additional twin trundle bed with standard twin mattress. There is plenty of room to spread out and play...or watch for pirates on the open seas! Plus, a secret hidden playroom with toys off the bunk room closet is waiting to be discovered! Come and explore! Guest Room: Upstairs guest room with queen bed just across the hall from a full tub/shower bathroom and next to the Bunk Room. Street views. This room pairs well with the Bunk Room to make its own family wing. Nearest beach: On its own private ocean beach!!! Additional availability info: 7 Day Minimum June-September. This is a Saturday to Saturday vacation rental. Additional pricing info: Cleaning Fee: $300 - Refundable Damage Deposit: $1500 - Off Season Full Week Discount : $3600/week, State and local taxes of 14.45% will apply. Kate and Paul met and married on the Cape. Their first child was born at Cape Cod Hospital and brought home to this house. 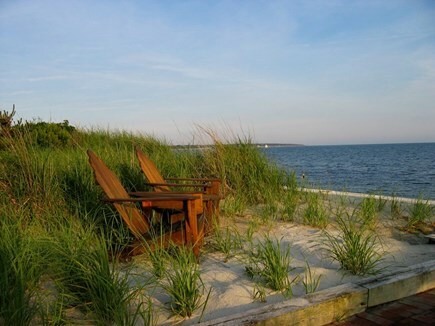 We have shared years of memories with family and friends on the deck and beach, and in the warmest ocean waters on Cape Cod. Work has taken us many states away, but we have grown to love sharing our home with other families so they, too, can build memories together! One of my favorite comments a guest made is after their second year in the home. The first year he replied how incredible the house, deck, and beach were for their extended family. However, my favorite comment came after year number two. He said his favorite memory that year was making sandwiches in the kitchen with his grandson. Our house allows multiple generations to relax together under one roof, making grand memories on the ocean or memories as simple as making sandwiches. Knowing we can provide a backdrop for this kind of relational magic makes sharing our house worth it! 1) OCEAN! The ocean is truly in your back yard and has the warmest ocean temperatures anywhere on the Cape. 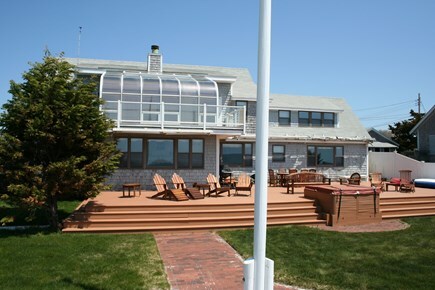 I love the combo of expansive deck, yard, beach, and ocean all within feet of one another. Small tides make this experience accessible to all ages. We also love the jetty down the beach for exploring sea life and shells. Kids love it and the jetty has a rich history! 2) HOT TUB! The hot tub is loved by everyone year-round. What is better than slipping into steaming waters while taking in the salt air and ocean breezes, but secretly I love the hot tub because it makes being outdoors by the ocean a four season experience! There is nothing like watching the boats on the horizon from the hot tub surrounded by snow! 3) THE HOUSE LAYOUT! What I love most about this house is the layout...I love that it has so many places to ''get away'' from it all. A second living room, a secret playroom, an atrium office, and six bedrooms. Everyone can truly have their own space even when large numbers are staying in the house. 4) PROXIMITY! Most of our guests never want to leave once they arrive, but for those that need groceries, or the mall, or restaurant options, etc...we are centrally located and minutes from all major needs and wants! 5) QUALITY! 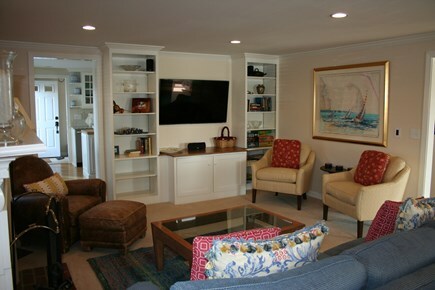 Custom furniture, original artwork, surround sound, a fully stocked kitchen. This is truly home away from home! While our house sits in a beach neighborhood away from any commercial activity, our town is at the center of all your needs and wants. The Cape is made up of 15 towns, but Hyannis has the mall, the hospital, the island airport, the island ferries, the bus station, the big box retailers, and the largest movie theater. Hyannis is the hub of the Cape. We love having amenities at our fingertips whenever we feel like venturing beyond our little piece of heaven...which is not often!